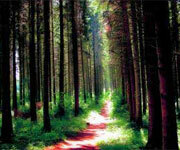 Carbon Footprint enables you to "Pledge a Tree" that will be planted & grown in the area of your choice. We use the local knowledge and expertise of tree planting partners to ensure the right trees are planted in the appropriate places. The trees are predominantly planted in school grounds, reserves and managed woodland where they will live their natural lifespan and meet their biodiversity targets. Each tree planted helps to offset your environmental impact by "breathing" in CO2 emissions as it grows. The trees also provide sustainable habitat for wildlife and will enhance the natural landscape with native broad-leaved trees. Our UK Trees programme incorporates "Tree Buddying". This means for each tree you pledge we also offset one tCO2 through a Verified Carbon Standard (VCS) project. in addition to delivering all the other great benefits of the UK Tree planting programme.